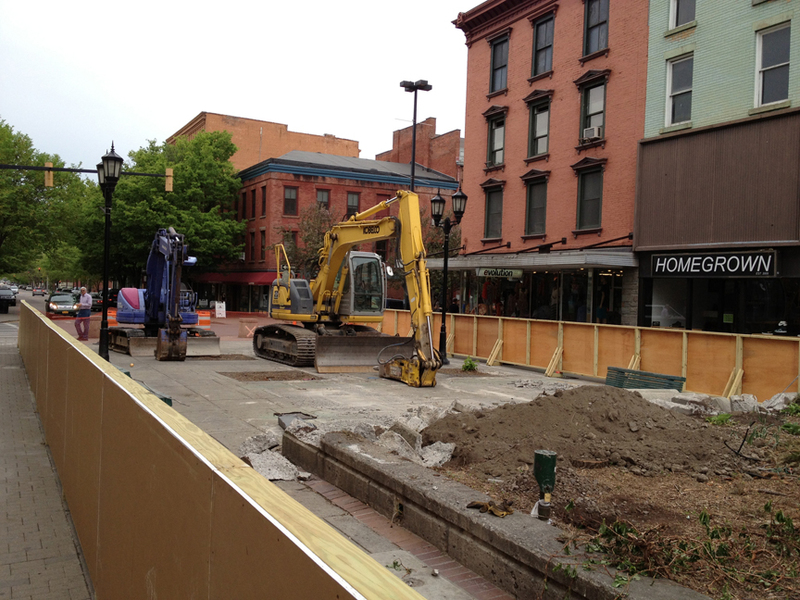 The 40-year old pedestrian mall at the center of Ithaca, NY is currently being reconstructed according to a design by Sasaki Associates. The project will cost an estimated $10 million and is projected to continue in two phases through June of 2014. While a bit difficult to discern from the published documents, it seems to be what you would expect — contemporary, thoughtful, well- executed, and a bit generic. Small nods are made to both place-specific qualities and regional characteristics while the landscape is organized according to generally acceptable principles like flexibility, durability, and change through the seasons. 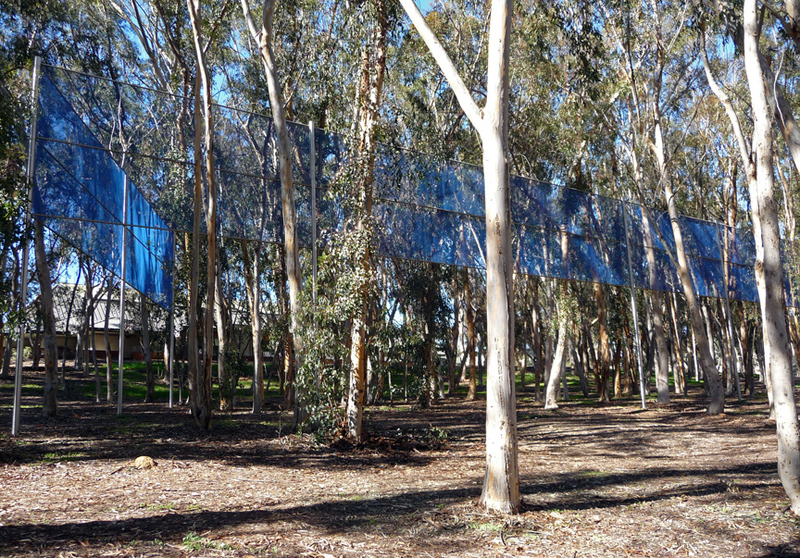 What I am interested in regarding this project is the possibility of a provisional landscape. That is, a landscape which is both temporary– adopted for the time being- and which provides things. With any public landscape, especially complex undertakings such as building new infrastructure or remediating superfund sites, the amount of time during which construction and maintenance operations render the public landscape private is substantial and results in a loss of use-value. I’ve written before here why the recovery of this value is an opportunity for an expanded range of aesthetic experiences and should be of concern to designers of public landscapes. It is, however, a very difficult case to prove. 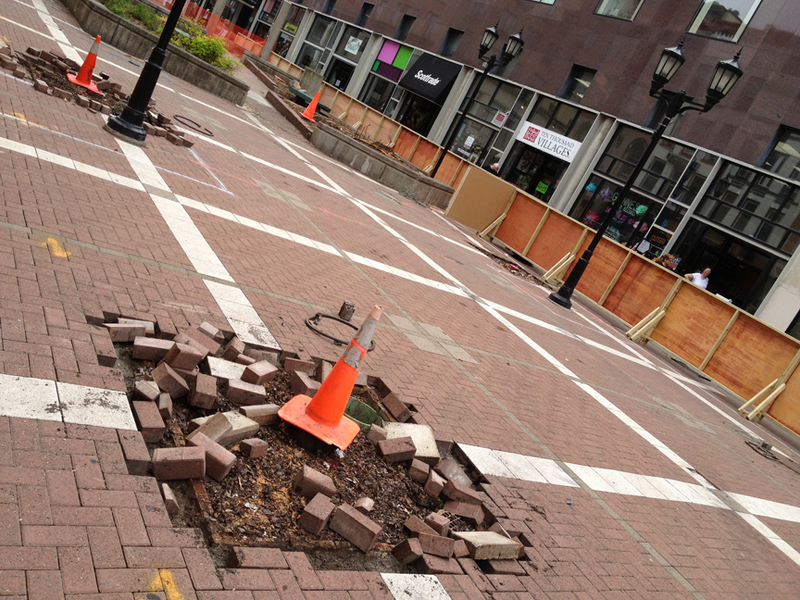 The first iteration of the Ithaca Commons was constructed in 1974, giving the landscape a useful life of 39 years. If that is taken as a stand-in for this next iteration, then by using the capital cost of this project projected out over 39 years, we know that there is a capital use-value loss of $384,000 due to the temporary privatization of the public landscape. This is different from the direct use-value loss, which is the lost value of services (such as recreation) that can be provided by for-profit facilities, such as a gym or rock-climbing wall (in any case, these tend to be negligible in pedestrian malls, and higher in Robert Moses-style recreation parks). A quick survey of the results of public meetings that occurred during the design planning process note under “Construction Planning” the following goals: 1) Construction must interfere as little as possible with the operation of businesses, 2) Access to Commons, businesses, and universal accessibility must be maintained, 3) Careful scheduling of construction hours, 4) Transition period should be a major focus of the plan. What stands out is how the entire construction process is being defined negatively; it is something to be mitigated and finished as quickly as possible. However, I am interested in the possibility that an instrumental approach will allow aspects of the provisional landscape to be turned from private to public, with the result being that the act of remaking this civic space becomes something to be celebrated and experienced in its own right. Public landscapes in our society are generally spaces of consumption (we consume experiences as well as goods and services in them) and the material practices that make it possible are viewed as a bothersome molting period that just has to be endured, or ignored, until it is over. This can be clearly seen in a quote by the local executive director of the Community School of Music and Arts, who noted that they were “really looking forward to a revitalized Commons, once it’s done.” That is an appropriate response considering how construction and maintenance is plotted and executed. It is also indicative of the low value we ascribe to the material operations that make our cities and landscapes possible. However, it is a misconception that the Commons landscape is in a larval state right now. The fact is, it is a landscape in its own right, one undergoing a process of radical change, offering its own aesthetic experiences, open to interpretations. It is just as finished right now as any landscape ever is. A stroll down the commons reveals a number of materials and objects in changing relation to one another, governed by a series of specific protocols yet bringing their own desires to the party. On my recent walk through the Commons-under-construction, a backhoe excavator and jackhammer were each aligned with the street, bucket and hammer resting gently on the ground surface. 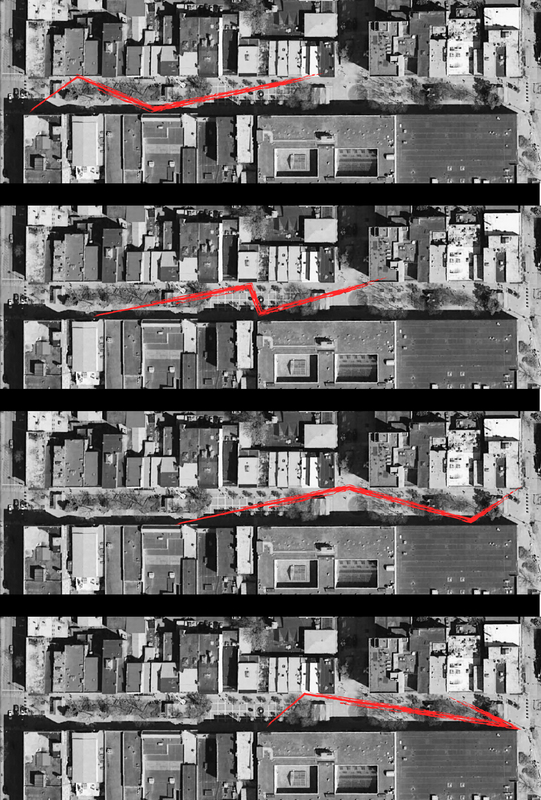 This is the result of a protocol, likely reading something like “all backhoe arms and treads shall be aligned lengthwise with the street so as to minimize transverse dimensions; all buckets and hammers shall be rested on the existing street surface to reduce strain on the hydraulic joints.” So we have here the intentions of the builders (minimize physical obstructions and strain on the equipment) with the demands of the instrument (my dimensions are huge relative to the cross width of this street, and my bucket is way too heavy to hang in the air off my arm overnight) in a sort of duel, each compromising and negotiating to conjure forth a public landscape of conflict and a muddy, metallic strain of beauty. There is something at stake here. With our approach to landscape-making we are deciding whether all we care about is the product, or if we are interested in the process. Do we only value landscape in terms of composition and meaning, which our art-historical bias has pushed us towards, or are we interested in and capable of understanding and engaging our cultural heritage of labor, machines, and technological expertise also, thereby expanding the range of aesthetic experiences in public landscapes and recovering lost capital use-value. If we are, then I think there are three guiding lights we might turn to in order to develop the conceptual and technical tools to design provisional landscapes: the history of technology, land art, and the trades. I’ll write more on how landscape architects might engage the history of technology, draw from the land artists, and work with the trades in the future. For the moment, it is interesting to think about what sort of provisional landscape might be conjured, and how it might define the processes and material operations of construction in a way that positively affects the local businesses and street life. Small observation towers might be constructed, or new protocols written for the arrangement of construction machinery at the end of the workday, when the evening life of the Commons begins. 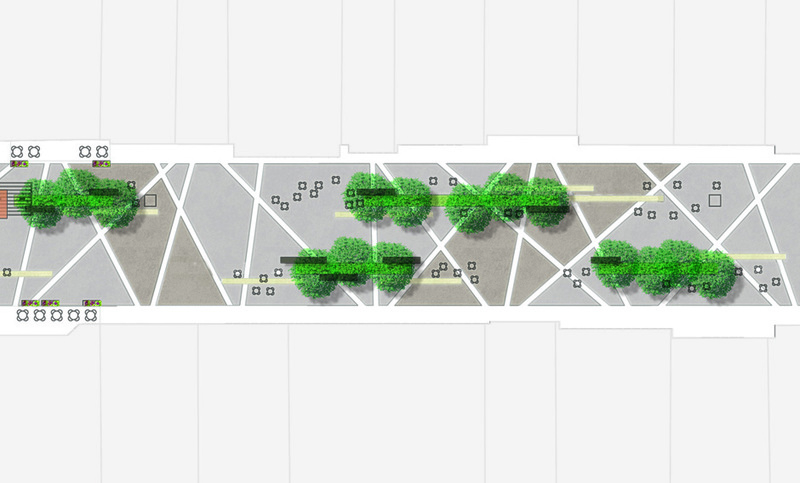 Or a simple but extensive scaffold system might be designed that both structures the phasing of construction and allows pedestrians to traverse the Commons. The range of technical expertise, material choices, and machinery at work in the landscape might become an object of fascination and revelry, the Commons a landscape offering aesthetic experience beyond the thoughtful-but-generic composition that is a backdrop for community life. Glad you are writing about this particular project! I find it exciting as both resident and student. I’ve been thinking about it and visiting it. The slow revelation of that which is generally cemented over is fascinating to observe over the little fence, which I guess is that height maybe to maintain views across the Commons, which allows the pedestrian to peer into the process in a much more intimate way than many construction sites (such as the fortress-like one across the street that had very high walls with no way to see in). So these walls have a lot of potential and can work for and against public perception of the process, I think. The daily, slow revelation and manipulation of conglomerate materials is satisfying to me in the same way that I watch and listen to the creek waters change every day throughout downtown, which I keep track of while running errands or going for a walk. My favorite part, though, and I think the best surprise, is that in removing the trees and heavy pavilions, we are rewarded with a beautiful view of distant scenic hills, backlit by sunsets, cloaked with dramatic weather — that I normally only see uphill towards Cornell — right in the plateau of downtown (I guess plateau in the context of the lake’s topography)! Even more important on this issue is that it momentarily balances out the simultaneous removal of this distinctive view directly up State Street — which to me was always an important vehicular gateway to downtown Ithaca — where they are going on a crazy massive generic apartment building glut. But this ephemeral reward will slowly dissolve as trees are planted, and grow, and any built structures obscure that view once again. A photograph capturing that view would be pretty valuable as commentary on the wonderful surprises of construction (though less associated with instruments)…but I’m not in Ithaca right now. Lastly, I know of a great site on the outskirts of Paris that I visited with Jeremy Foster, a provisional landscape that seems to work in favor of construction! I’ll email you about this.